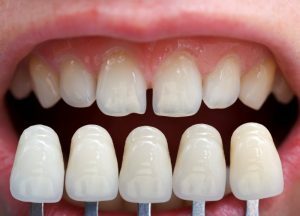 The lifespan of porcelain veneers largely depends on how committed you are to keeping your oral health in good condition. Thanks to their improved durability compared to composite resin veneers used in the past, porcelain veneers can last between 10 and 15 years when properly cared for. Of course, they may require replacement sooner if they become chipped, cracked, stained, or damaged enough to affect your smile’s appearance. While porcelain is considered as strong (sometimes stronger) than natural tooth enamel, they can still crack if you use your teeth improperly. Even though they are stain-resistant, micro scratches can still appear over time. Similar to how tooth enamel’s porous surface collects stains, these micro scratches can also cause veneers to discolor. While veneers are not permanent, the procedure to have them placed is, so you’ll want to make absolute sure that you want them before pursuing treatment. During your cosmetic consultation, your dentist will confirm that your oral health is in good condition and listen to your needs. Once they know which teeth you want covered, they can start the buffing stage. This requires removing very small amounts of tooth enamel, which is a permanent process. Then, they’ll take an impression of your smile and send the mold to a dental lab offsite. There, dental technicians will produce precise working models that fit over your natural teeth exactly. Next, you’ll come back for another appointment to have your permanent veneers placed using dental adhesive and an ultraviolet light to bond them. Practice daily oral care to keep your teeth healthy and your veneers white. Brush twice a day with fluoridated toothpaste, floss daily, and visit your dentist every six months. They’ll make sure your veneers are maintaining proper adhesion as well. Wear a nightguard if you grind your teeth at night. Use a mouthguard when participating in high-impact sports. Avoid using your teeth as tools to open packages, loosen knots, or trim your nails. Occasionally use a whitening toothpaste to remove surface stains if they appear. You can also reduce your intake of staining food and beverages, especially ones that are richly pigmentated. By practicing these habits, you’ll make your porcelain veneers in Estero last for years before needing replacements. Schedule an appointment with your dentist today to confirm if veneers are right for you! Dr. Rich Gilbert is a cosmetic dentist in Estero who graduated from the University of Florida College of Dentistry. He’s happy to go over all your options when it comes to improving your smile, including through porcelain veneers! To learn more about his practice, contact him through his website.